2018 is a year to forget for the Philippine automotive industry. 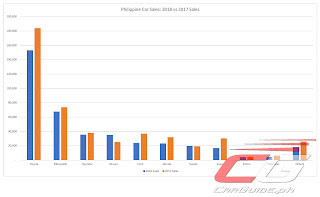 After 7 years of impressive growth, car sales dropped last year due to factors such as the implementation of the revised new vehicle excise tax (part of the TRAIN law) and the resulting higher inflation and weakening peso. But just how bad is bad? Analyzing data from the joint CAMPI-TMA (Chamber of Automotive Manufacturers of the Philippines and Truck Manufacturers Association) and AVID (Association of Vehicle Importers and Distributors), we took a closer look at how the Top 10 brands performed in 2018 compared to a year earlier. Based on this list alone, it’s clear which brands weathered 2018 better. While the Top 3 players remained constant for both years: Toyota, Mitsubishi, and Hyundai, the rest saw a re-shuffle. 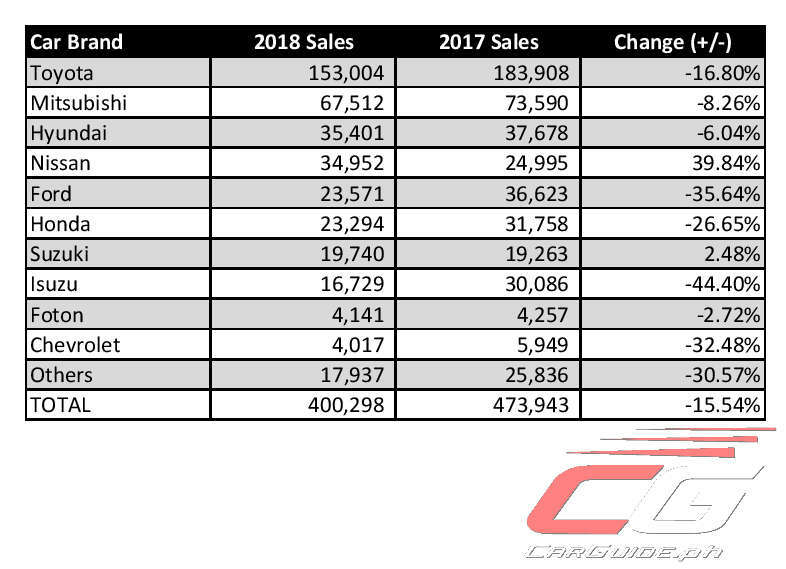 Lacking any significant updates to its volume models like the Mazda3 and CX-5, Mazda no longer reached the Top 10 in 2018 despite selling a healthy 5,247 units in 2017. As for the rest of the players, Nissan and Suzuki shot up at the expense of Ford and Isuzu. 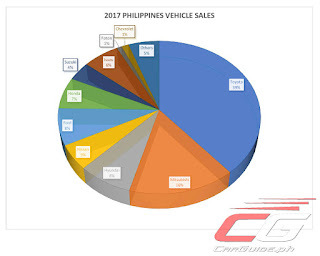 Number-wise, Isuzu and Ford were hit the most with sales declining 44.4 and 35.6 percent, respectively despite TRAIN heavily favoring pickup trucks and Ford having the advantage of several new product launches throughout 2018. 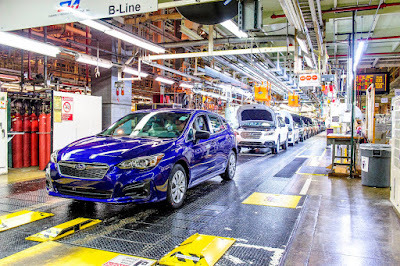 Joining them are two brands that had a relatively quiet year with the lack of new product offerings: Chevrolet (32.48 percent) and Honda (26.65 percent). Meanwhile, brands like Suzuki and Foton remained steady last year. Foton in particular, had a very solid year calling true the automaker’s prediction that they’ll enter the country’s best-selling brands list in 2018. For 2019, CAMPI and TMA expects a recovery of about 10 percent, a figure agreed upon by AVID as well. Unfortunately, we still think this is quite optimistic. Boldly predicting the automotive industry this year, we think the overall industry might just be in for a 5 percent improvement, despite the mid-term elections happening this year. It’s highly likely that brands such as Toyota and Mitsubishi will continue to sell strongly, driven by newer product offerings as well as aggressive sales and financing promotions. Hyundai will also keep the third spot again this year, while its sister brand, the newly Ayala acquired Kia will enter the Top 10 once more, but unlikely meeting its 10,000-unit target (a modest 6,000-unit sales is more likely). 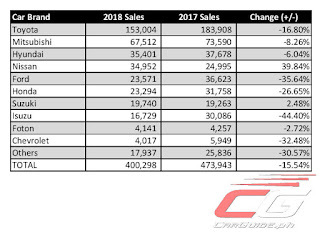 Nissan will continue to sell strongly this year, but without any new mainstream products in the pipeline, it’s unlikely that they’ll be able to achieve the same stratospheric growth they did last year. 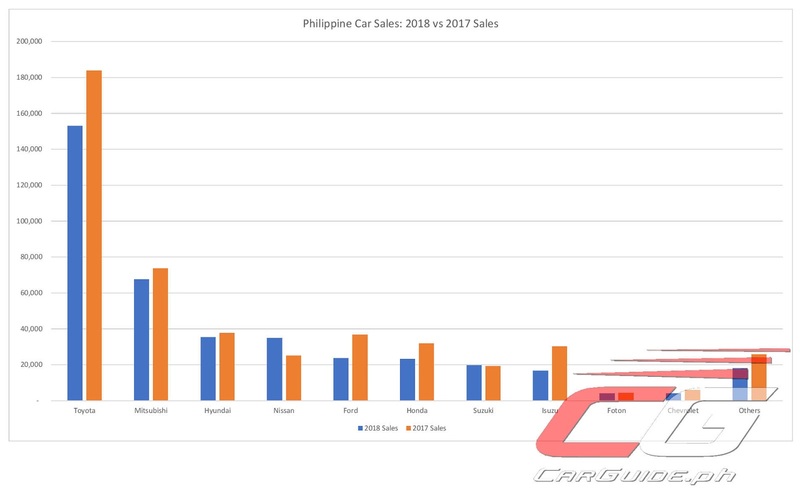 Honda, Suzuki, and Foton will stay put where they are with similar numbers, while barring a miracle, both Ford and Chevrolet will continue their decline. For Isuzu, 2019 will be recovery year as it strives to come to terms with the possibility of focusing on business-oriented trucks rather than passenger vehicles. I think car industry will still be on a slump this year, much worst than last year.